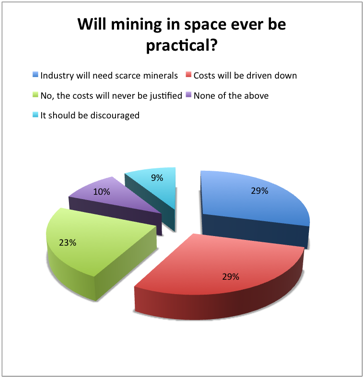 Two-thirds of engineering readers are believe that we will mine for minerals in space. We saw a very split result in last week’s poll. Of the 462 respondents, 29 per cent believed that there would be a need to source scarce minerals and precious metals from space (by prospecting from asteroids); the same proportion thought that the cost of such prospecting would be driven down over time. In fact the first option was ahead, but only by two votes. the next option, 23 per cent, thought that the costs would never be justified. Only 9% thought that mining in space should be discouraged, while 10% declined to pick an option. Please continue to send us your opinions on this subject. 1. The would-be asteroid miners (the beneficiaries) should pay for ARRM, not NASA. 2. Mining asteroids would be MUCH more “iffy” and difficult than mining on the Moon – but would also be MUCH more difficult to supervise, which probably accounts for its attraction. 3. If you mine an asteroid, how do you separate the spoil and where do you put it? You can’t afford to transport more than the ore and you don’t want it floating off into space, to collide with your transport ships. The immense cost of bringing each kg to and from earth’s surface means the resources would almost certainly never be shipped to us on an industrial scale. That means any resources gathered in space will only be used in space. In which case the most valuable thing to mine is water & other resources that while cheap on earth are immeasurably valuable in space. The first mining and manufacturing facility, I believe, should be to mine space junk and manufacture satellites in an orbiting plant. This would have the dual benefits of saving on putting the satellite into orbit and improving orbital safety. I assume that it would be vastly cheaper to begin the process of mining in space today when the target minerals are still readily available on earth, than it would be to wait several decades until scarcity has driven prices high enough to make space mining profitable. If this assumption is true, then in the long term we can argue that it is a far bigger risk to not invest. I have difficulty believing that mining elements to bring back to earth would ever be economically cheaper vs recycling the materials we use here on the surface. On the other hand, manufacturing in space for materials used in space will eventually be economic. I find it a shame that something with such ambition and possible potential in the long run, is responded to by over 50% of respondents (so far) with the two options which mention cost. Even though they are seeming opposite responses they reflect what is the problem with how even future oriented engineering is now discussed, very much in terms of the ‘present’. It should be totally encouraged! Perhaps there should have been some more “positive” answers in the poll. I replied that “costs will come down” – of course they will, and one day – perhaps in a Century, perhaps in a millenium, there will be more stuff mined from asteroids than from Planet Earth. Sending a rocket into space to collect each Kilogram of material would be a non starter. They will need to manufacture space/aircraft on the asteroid (using 3D printing, lasers and solar panels), but they will probably take tiny electronic controllers (in batches) from Earth to guide each craft back. So if you are mining platinum, you would make platinum air/spacecraft, add a control unit to each one and launch them towards Earth. They could be autonomous or radio controlled. I used to teach a case study on manufacturing contact lenses in space. The cost of transfer is small compared with the value of the goods. I argued that there might be a quality advantage from manufacturing in zero gravity and, if you choose a product with a high enough value per kg, it is viable. Maybe in 500 years, if we didn’t learn until then to live within our means. The resources mined there will have to be used in automatic factories there to build further space equipment. Until then maybe we could learn to make triple insulated windows that keep heat inside the house and light tunnels that allow to switch off billions of office lights during daytime. *Eventually* it will become economically viable but not anytime soon. I remember reading a statement once that if there were gold bars lying on the surface of the moon it would not be cost effective to go get them and bring them back. Space travel will have to become a lot less expensive before we mine minerals from space for use on Earth. Mining minerals from space for use in space will come much sooner but is still a long way off. If we are to build manned space craft for deep space exploration they will need enough mass to shield the crew from radiation. Perhaps we can mine, cast and machine heavy bits in low gravity e.g. the moon and assemble the structure and shielding in space. I would be surprised if NASA havent considerd this already. If we can bring down the cost of getting into space, say with Skylon or a space elevator, then maybe. I suspect the mining will be done by robots rather than humans. Parking valuable asteroids at those gravity points between the Earth & Moon, would keep them where you could exploit them. 3D printing could lead to offworld manufacture with local materials. Voted “None of the above”. As with previous comments, the most benefit will be for in-space use, and the majority will likely be for non-scarce bulk materials such as regolith (shielding), metals (construction) and volatiles (propulsion) – i.e. almost any mass not found at the bottom of a deep gravity-well (such as Earth). Worth remembering Gerard K O’Neill’s work showing that planets are an inefficient uses of available mass for habitation, when our civilization becomes truly space-faring. Before we start, there needs to be an international understanding on who owns what, or are we considering a ‘free for all’ when it comes to space ‘landgrabs’. The driving force behind any venture of this nature, has to be the development of a totally new propulsion system. Until that comes along this is just speculation. Such as an air-breathing rocket engine, enabling single-stage to orbit with 48 hour turn-around and the potential to reduce cost/kg by two orders of magnitude? Would that do? See Reaction Engines work on the SABRE engine and Skylon SSTO spaceplane. I remember back in college lecture everyone laughing at me for suggesting mining in space… now who’s laughing! Think we will need to mine in space if we are to ever venture out into the deep. Something needs to happen to make space a commercial affair because that really will drive prices down and technology forward. I also don’t, at the moment, see why it should be so uneconomic. Getting things “up” is the hard part. I can imagine packing mined materials into heat-shielded canisters and gently tossing them back to the edge of our gravity well. After that the ride is free. Blog post by the physicist Tom Murphy of UCSD who has put the effort in to do the maths. In conclusion, even using extremely favorable efficiency, the energy return on energy invested makes retrieving resources from space unfeasible. On a strictly technical view, Space Based Solar Power pays back its energy investment in a matter of weeks and would have the greatest impact on eliminating unsustainable terrestrial resource usage (such as fossil fuels). It would be both a catalyst for and major consumer of space mining (following initial powersats built from Earth materials). Start first, by removing or collecting/recycling the rubbish cloud already enveloping planet Earth from the first 40 years or so of near-earth exploitation. Yes, collect it by autonomous collector and harvest the material already up there. Agreed. Collect it, then use refueled stages already in LEO to transport it to the Moon, where it will be simplest to set up a recycling plant. That’s backwards thinking. If we don’t use resources in space, then we’re stuck down here in a giant zero-sum game where to have something, you must take it from others. Isn’t backwards thinking rather “to use and throw away”? You all need to read a bit of science fiction. The concept of mining asteroids was “old hat in the 1960s and 70s. A considerable number of stories which included the technical and engineering problems, not to mention editorials in SF magazines, ought to be read by anybody interested in the subject. Try it. I don’t think we have even scratched the surface of the earth in our exploration for scarce minerals. We have an abundance of minerals in various parts of the world and we haven’t even looked under 99.999% of the sea bed.